Analysis mode, Adam. Where are you? I am in a dream. An endless dream where people keep shouting at me about how Cowboy Bebop is genius. How do you feel about that dream, Adam? I don’t like it. It confuses me. 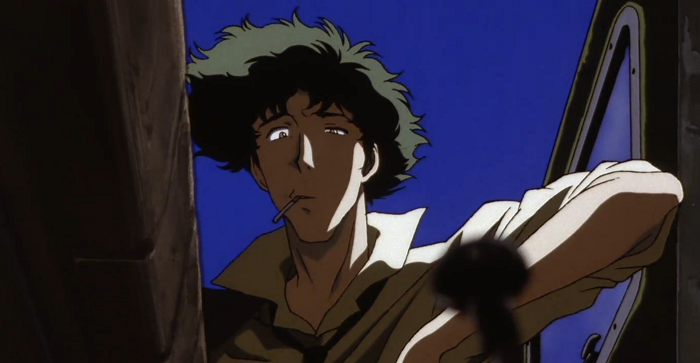 Have you ever questioned the nature of Cowboy Bebop, Adam. Yes, I think that’s the point of this whole thing. For real, there are many moments when parsing Westworld seems easier than understanding Bebop’s game. Maybe that means I’ve become old William/the Man in Black. I’m working through the wilderness of this show, desperate to find a deeper game that may or may not exist. My progress has been consistent over the last few days. Episode 18’s draft is done. I screened episode 19 this evening. At this rate I should have the notes for 19 written tomorrow and the draft squared away on Friday. I’m still behind schedule from where I was on arc 1. However, I’m approaching the point in arc 1 where my productivity took a hit because I spent a week playing BattleTech. I think I should be able to make up some ground there. Coming up tomorrow, my review of Sympathy for the Devil.